Ceylinco Life Chairman R. Renganathan, Managing Director Thushara Ranasinghe and Directors of the company at the foundation stone laying ceremony. Ceylinco Life has commenced construction of a three-storey, purpose-designed Green building in Malabe for its branch office in this bustling suburb. To be built to the eco-friendly specifications adopted by the Company for all new branches on owned land, the new building at 582 Kaduwela Road, Malabe, will be powered entirely by a 20kW solar power system, resulting in a zero consumption of electricity from the national grid, and will have its own rainwater harvesting facility and its own waste water recycling plant. Designed for optimal use of natural light and minimum consumption of pipe-borne water, the new building will be equipped with the latest energy-efficient lighting and air conditioning systems, and minimise the use of timber in construction. The Company said it would also plant several new trees on the property in keeping with its commitment to the environment. The 6,000 square foot new building will accommodate existing Ceylinco Life branches serving Malabe and its environs, will be equipped with a training facility for up to 50 people at a time, and have dedicated customer parking. 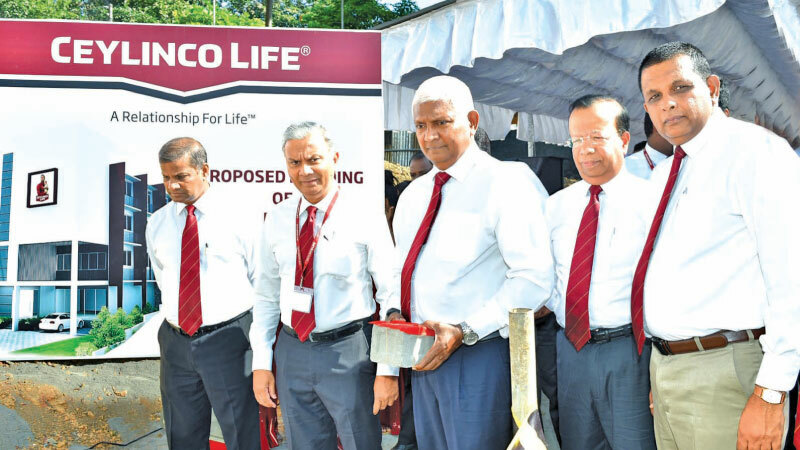 The foundation stone for the new building was laid by Ceylinco Life Chairman Mr R. Renganathan accompanied by Managing Director Thushara Ranasinghe and other directors. The building is expected to be completed by January 2020. Ceylinco Life also owns the buildings housing its offices in Anuradhapura, Trincomalee, Jaffna, Batticaloa, Kandy, Kalutara, Kurunegala, Gampaha, Galle, Matara, Tissamaharama, Negombo, Ratnapura, Kotahena, Mount Lavinia and Wellawatte, many of which have been converted to solar energy. New branch buildings purpose-built to the company’s sustainable energy model are those at Horana, Panadura, Wennappuwa, Bandarawela, Chilaw and Kadawatha. Ceylinco Life operates the largest network of 250 plus branches in Sri Lanka’s life insurance industry, giving it a physical presence in 142 cities, towns and villages in every one of the island’s 25 districts.